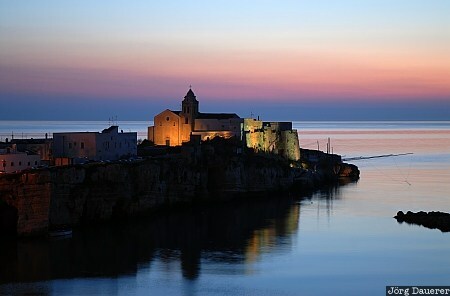 Vieste and the floodlit Ciesa di S. Francesco at the Mediterranean Sea before sunrise on the Gargano peninsula in Apulia (Puglia), province of Foggia in southern Italy. This photo was taken in the morning of a sunny day in April of 2006. This photo was taken with a digital camera.